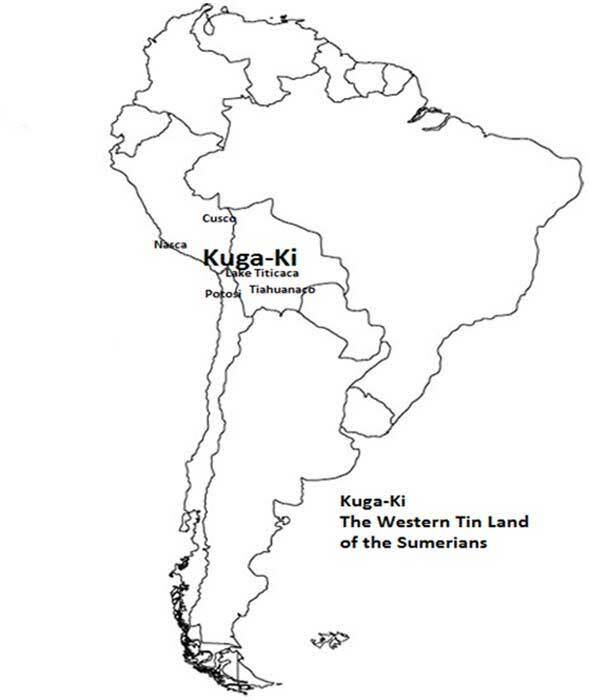 It is becoming increasingly clear that the Sumerians had established a colony in South America called Kuga-Ki. Kuga-Ki was the "Tin Land of the West" or the "Sunset Land", in Sumerian inscriptions. The Sumerians left several inscribed artifacts in South America. The Pokotia monument and the Fuente Magna bowl were written in linear Sumerian. The fact that the writing existed on the Fuente Magna Bowl, and Pokotia monument in Sumerian, and the identification of Sumerian place names on the Altiplano suggest that Ecuador to Bolivia, was Kuga-Ki. Researchers have suggested that some of the Gold tablets in the Crespi Collection may also be written in linear Sumerian. Father Carlos Crespi Croci collected thousands of artifacts that he claimed were found by local Indians in caves of Ecuador. Father Crespi was born in Milan, Italy, in 1891 and died in 1982. There are supposedly many engraved tablets in the Crespi Collection. Erich von Daniken in Chariots of the Gods , was the first researcher to bring to our attention some of the ancient tablets in the Crespi Collection. I have wanted to read the Crespi Tablets for years. But I avoided attempting to read the Tablets because all we have are photographs of them. The photographs of the Tablets often lack a full representation of the inscriptions or the lighting is poor, so it is difficult to make out the signs. Even though this is the case, I will attempt to read some of the Crespi Tablets, because they may give us more insight into the culture and religion of the Sumerians at Kuga-Ki. I used Ball and Halloran Sumerian word-lists to read the Crespi Metal Tablets. In my book Ancient Scripts in South America , I discuss the Sumerian symbols found on the textiles of Inca Sagas. In the Guaman Poma we find many Inca rulers called Saga or Capac that have Proto-Sumerians signs similar to the signs in the textile worn by the Ecuadorean elite from the Crespi Collection. The names of the Crespi elites are either found on the textile hanging from the waist of the Shaman or the flaps hanging down from the headband of the Chief. 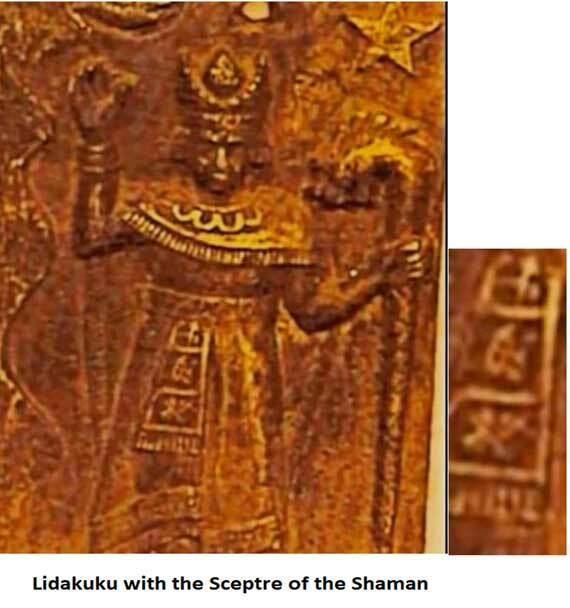 There are two Shaman in the Crespi Tablets. The first Shaman holds a staff in his left hand. The right hand is held high as if greeting someone. The name of this Shaman is on the textile hanging from his waist. 1) Lu pa Mash. 2) Lidakuku. 3) Mash mi ta. The translation is “1) The man [with] the Sceptre of the Shaman. 2) Lidakuku. 3) The Shaman [Lidakuku] is bound to the Oracle”. From this tablet we learn that the Shaman carried a staff as a symbol of authority. 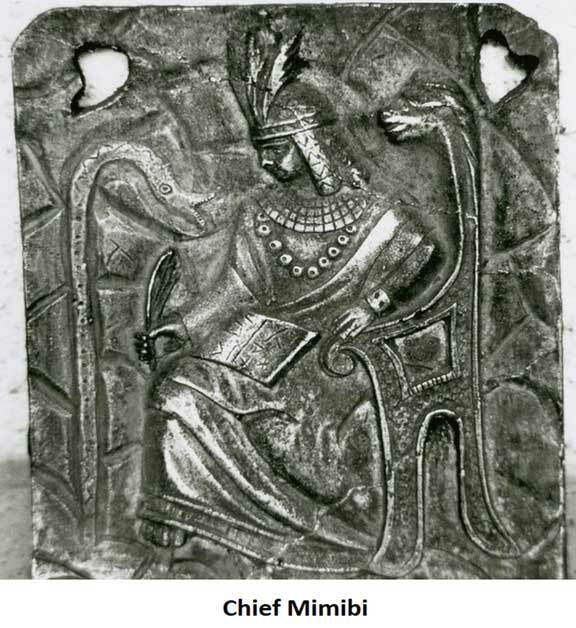 A Sumerian Chief in the Tablets? The next Crespi Tablet has a man sitting on a throne, with a stylus in his hands and an inscribed document on his lap. The man wears a headband with flaps hanging down from the headband. This elite wears feathers in his hair. There are four panels containing inscriptions on the flap of the headband. These panels contain the name of this Chief. From top to bottom we read: 1) Mi mi, 2) Bi, 3) Ga, 4) Lu. 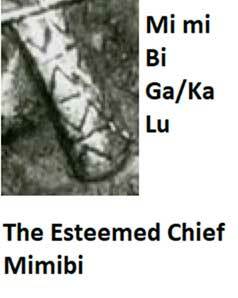 The signs on the headband flap, says “(1-2)Mimibi, 3[the]Chief 4) esteem”, or “Mimibi the Esteemed Chief”. 1) a i mi mash, 2) i i lu li mi I, 3) Mash. We read the following “1) The strong powerful oracle [of the] Shaman, 2) The glistening Oracle witnesses [the man’s rise]. 3) [This] Divine Decree”. Transcription: 1) The strong powerful (man) is the oracle of the Shaman. 2) Witness the powerful man’s rise. The glistening oracle [is its] withness. 3) [This is a] Divine Decree. 1) Mash, 2) Ta I lu se, 3) ta se, 4) me i. The translation is 1) Shaman, 2) Tailuse, 3) binds the patron, 4) the oracle rise, or “The Shaman Tailuse binds the patron to the oracle rise [it up]”. At the feet of Shaman Tailuse were a number of inscriptions. The inscriptions are on the right and left sides of Tailuse. “…..2) Open [up] amazing Character to witness [a] strong luster and leave open tru[th]. 3) Witness the Shaman [Tailuse] to leave and open [up] a Spell [from] the Strong Father of the Oracle. Witness the powerful (man’s) rise. 4) Entrust the glistening Oracle [of] the powerful man; In order to make libation[s]. Witness [its] shine. Open [up] the Spell. Witness [its] open.5) The Father [Tailuse] to witness strength and increase benefit(s) [for all]. The Shaman [Tailuse] is a strong Father [of the] Oracle to witness purity”. 1) Se jo ta Mash. 2) Lu ki. The translation of these signs reads: “1) The patron [Tailuse] to benefit [from] and stand by the Oracle. 2) This man is Noble”. The translation of the left side of the Tailuse Tablet reveals, “1) Bind the witness [Tailuse] to the Cult; the progenitor of many people [Tailuse] to rise [up] a shining Spell. A spell to nourish exaltation. (2) Rise up the character of the Shaman’s Goodness. Witness [its] rise. 3) The divine decree to rise [up] a phenomenal area of the deity’s word”. Another interesting Crespi Tablet has two women, with inscriptions of either side of the females. The inscriptions on the left side of the tablet are dark and I have not tried to decipher the text. 1. Imi Yu me pa i pa i lu mi pa su. 2. Su me me-I ge mi Mash ka. 3. Ga ta i ta i ta lu ta. 1. “The glistening powerful oracle act [to] send forth esteem. Send forth to the progenitor of many people the power of the divinity to reveal to [mankind] Knowledge. 2. Spread the divine shining oracle [over all] to establish the Shaman’s esteem. 3. [In the] house entrust exalted character, to raise to touch many people entrusted [to the] Shaman. 4. Declare witness to the fear [of God] to leave open wisdom [and] open exaltation [for all]”. The inscription on the Two Women Tablet indicates that it was meant to represent a Temple where the people would congregate to hear the oracle. It probably indicates that females were matrons of the shrine who relayed messages from the Gods. 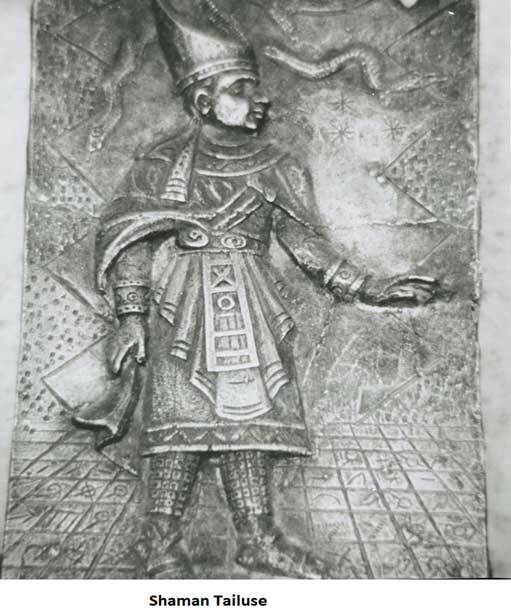 In summary, the Crespi metal tablets make it clear that the people of Kuga-Ki recognized oracles as a source of communication and consultation with their Gods. The Crespi Tablets of the Shaman make it clear that they were considered the Father of the (community of) believers and administered religious services at the Kuga-Ki temples and shrines. 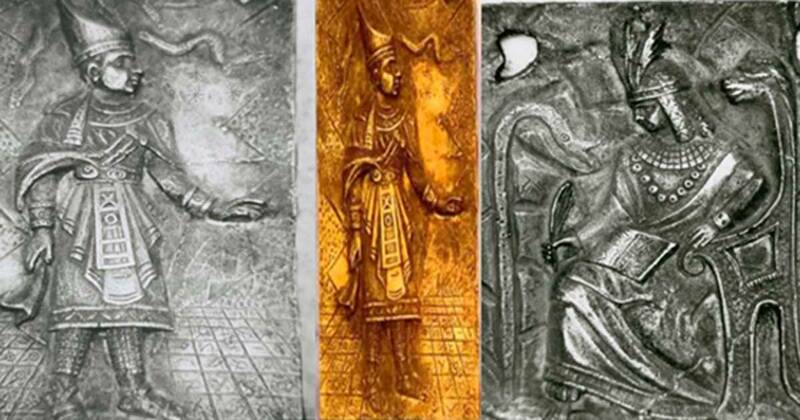 Top image: Shaman, Shaman and Chief from Father Crespi tablets photos. Images provided by the author. Ball, Charles James, Chinese and Sumerian . The Crespi tablets were discredited as fakes long ago. Is there any idea how Sumerians made the journey from what is now the Middle East to South America? As the oldest know civilization, I would think this would put to rest the idea that the Ancients had no knowledge of the planet or the continents. I would love to see more about this.